Helping Hands: Raise Funds Easily with Mr. Clean on Your Side! IT’S EASY No buckets or mops. You’re simply selling certificates around town or at events. IT’S QUICK For each $16 sold, you keep $8! With 20 members selling 10 certificates each, that’s $1,600! IT’S FLEXIBLE Sell your certificates, return unsold ones or get more. IT’S FUN We can imprint your logo on the certificates* to raise awareness for your group. 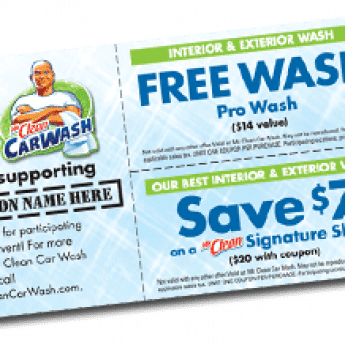 IT’S WIN-WIN Raise money while providing what your supporters want - a great wash from Mr. Clean Car Wash! Coach Dooley has partnered with Helping Hands at his nearby Mr. Clean Car Wash for three years now. In that time, the Collins Hill High School Girls Softball Team has raised over $14,000. Helping Hands gave Coach Dooley’s team a simple and effective way to raise enough money to travel to the state finals, but the Collins Hill High School Girls Softball Team won the championship all on its own.